"Tartar language" redirects here. For other languages, see Tatar languages. ᡤᡳᠰᡠᠨ manju gisun) is a critically endangered Tungusic language spoken in Manchuria; it was the native language of the Manchus and one of the official languages of the Qing dynasty (1636–1911) of China and in Inner Asia. Most Manchus now speak Mandarin Chinese. According to data from UNESCO, there are 10 native speakers of Manchu out of a total of nearly 10 million ethnic Manchus. Now, several thousand can speak Manchu as a second language through governmental primary education or free classes for adults in classrooms or online. The Manchu language enjoys high historical value for historians of China, especially for the Qing dynasty. Manchu-language texts supply information that is unavailable in Chinese, and when both Manchu and Chinese versions of a given text exist they provide controls for understanding the Chinese. Like most Siberian languages, Manchu is an agglutinative language that demonstrates limited vowel harmony. It has been demonstrated that it is derived mainly from the Jurchen language though there are many loan words from Mongolian and Chinese. Its script is vertically written and taken from the Mongolian alphabet (which in turn derives from Aramaic via Uyghur and Sogdian). Although Manchu does not have the kind of grammatical gender that many Indo-European languages do, some gendered words in Manchu are distinguished by different stem vowels, as in ama "father" vs. eme "mother". The Manchu language uses the Manchu script, which was derived from the traditional Mongol script, which in turn was based on the vertically written pre-Islamic Uyghur script. Manchu is usually romanized according to the system devised by Paul Georg von Möllendorff in his Manchu grammar. Its ancestor, Jurchen, used the Jurchen script, which is derived from the Khitan script, which in turn was derived from Chinese characters. There is no relation between the Jurchen script and the Manchu script. Chinese Characters can also be used to transliterate Manchu. All the Manchu vowels and the syllables commencing with a consonant are represented by single Chinese characters as are also the syllables terminating in i, n, ng, and o; but those ending in r, k, s, t, p, I, m are expressed by the union of the sounds of two characters, there being no Mandarin syllables terminating with these consonants. Thus the Manchu syllable am is expressed by the Chinese characters a-muh (8084, 7800) (阿木 a mù), and the word Manchu is, in the imperial Manchu dictionary, spelled in the following manner: Ma (7467) -a (8084) gan (2834) (瑪阿安 mǎ ā ān) —Man; —choo (1303) a (11767) (諸烏 zhū wū) chu; —Manchu. Mongols learned their script as a syllabary, dividing the syllables into twelve different classes, based on the final phonemes of the syllables, all of which ended in vowels. The Manchus followed the same syllabic method when learning Manchu script, also with syllables divided into twelve different classes based on the finals phonemes of the syllables. Today, the opinion on whether it is alphabet or syllabic in nature is still split between different experts. In China, it is considered syllabic and Manchu is still taught in this manner. The alphabetic approach is used mainly by foreigners who want to learn the language. Studying Manchu script as a syllabary takes a longer time. Despite the alphabetic nature of its script, Manchu was not taught phoneme by phoneme per letter like western languages are; Manchu children were taught to memorize all the syllables in the Manchu language separately as they learned to write, like Chinese characters. Manchus when learning, instead of saying I, a---la; I, o---lo; &c., were taught at once to say la, lo, &c. Many more syllables than are contained in their syllabary might have been formed with their letters, but they were not accustomed to arrange them otherwise. They made, for instance, no such use of the consonants I, m, n, and r, as westerners do; hence if the Manchu letters s, m, a, r, t, are joined in that order a Manchu would not able to pronounce them as English speaking people pronounce the word smart. The Qing dynasty referred to the Manchu language in various Chinese titles such as "Qingwen" 清文, or "Qingyu" 清語 ("Qing language") and Guoyu 國語 ("national language"), which was used by previous non-Han dynasties to refer to their languages. The "national" was also applied to the Manchu writing as in Guowen 國文 in addition to Guoyu 國語. In the Manchu language version of the Treaty of Nerchinsk, the term "Chinese language" (Dulimbai gurun i bithe) referred to all three Chinese, Manchu, and Mongol languages, not just one language. Guoyu now refers to Standard Chinese. Official designation for China in Manchu, reads vertically to the next word to the right: "Dulimbai gurun". While Northern Tungus languages like Evenki retain traditional structure, the Chinese language is a source of major influence upon Manchu, which is southern Tungusic, altering its form and vocabulary. In 1635 Hong Taiji renamed the Jurchen people and Jurchen language as "Manchu". Manchu began as a primary language of the Qing dynasty Imperial court, but as Manchu officials became increasingly sinicized, many started losing the language. Trying to preserve the Manchu identity, the imperial government instituted Manchu language classes and examinations for the bannermen, offering rewards to those who excelled in the language. Chinese classics and fiction were translated into Manchu, and a body of Manchu literature accumulated. As the Yongzheng Emperor (reigned 1722–1735) explained, "If some special encouragement … is not offered, the ancestral language will not be passed on and learned." Still, the use of the language among the bannermen was in decline throughout the 1700s. Historical records report that as early as 1776, the Qianlong Emperor was shocked to see a high Manchu official, Guo'ermin, not understand what the emperor was telling him in Manchu, despite coming from the Manchu stronghold of Shengjing (now Shenyang). By the 19th century even the imperial court had lost fluency in the language. The Jiaqing Emperor (reigned 1796 to 1820) complained about his officials being good neither at understanding nor writing Manchu. By the end of the 19th century the language was so moribund that even at the office of the Shengjing (Shenyang) general, the only documents written in Manchu (rather than Chinese) would be the memorials wishing the emperor long life; at the same time period, the archives of the Hulan banner detachment in Heilongjiang show that only 1% of the bannermen could read Manchu, and no more than 0.2% could speak it. Nonetheless, as late as 1906–1907 Qing education and military officials insisted that schools teach Manchu language, and that the officials testing soldiers' marksmanship continue to conduct an oral examination in Manchu. The use of the language for the official documents declined throughout the Qing history as well. Especially at the beginning of the dynasty, some documents on sensitive political and military issues were submitted in Manchu but not in Chinese. Later on, some Imperial records in Manchu continued to be produced until the last years of the dynasty, which was overthrown in 1912. A large number of Manchu documents remain in the archives, important for the study of Qing-era China. 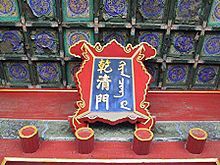 Today, written Manchu can still be seen on architecture inside the Forbidden City, whose historical signs are written in both Chinese and Manchu. Another limited use of the language was for voice commands in the Qing army, attested as late as 1878. A Jiangsu Han Chinese called Shen Qiliang wrote books on Manchu grammar like 清書指南 (Manju bithe jy nan) and 大清全書 (Daicing gurun-i yooni bithe). He was born to a father who was a naval officer for the Qing and his grandfather was an official of the Ming dynasty, before rebels murdered him. Shen Qiliang himself fought against the Three Feudatories as part of the Qing army. He then started learning Manchu and writing books on Manchu grammar from Bordered Yellow Manchu Bannermen in 1677 after relocating to Beijing. He translated the Hundred Family Names and Thousand Character Classic into Manchu and spent 25 years on the Manchu language. Shen wrote: "I am a Han. But all my life I have made a hobby of Manchu." Shen never had to learn Manchu as part of his job because he was never an official so he seems to have studied it of his own will. Most Han people were not interested in learning non-Han languages so it is not known why Shen was doing it. A Hangzhou Han Chinese, Cheng Mingyuan, helped edit the book 清文啟蒙 Cing wen ki meng bithe which was co-written by a Manchu named Uge. Uge gave homeschooled Manchu language classes which were attended by his friend Cheng. Cheng arranged for its printing. Han Chinese at the Hanlin Academy studied the Manchu language in the Qing. The Han Chinese Hanlin graduate Qi Yunshi knew the Manchu language and wrote a book in Chinese on the frontier regions of China by translating and using the Grand Secretariat's archives Manchu language sources. Hanlin Academy in 1740 expelled the Han Chinese Yuan Mei for not succeeding in his Manchus studies. Injišan, and Ortai, both Manchus, funded his work. The Han Chinese Yan Changming had the ability to read Tibetan, Oirat, and Mongolian. Han Chinese officials learned languages on the frontier regions and Manchu in order to be able to write and compile their writings on the region. A Manchu language course over three years was required for the highest ranking Han degree holders from Hanlin but not all Han literati were required to study Manchu. Towards the end of the Qing it was pointed out that a lot of Bannermen themselves did not know Manchu anymore and that Manchu was not able to be forced upon the people and minister of the country at the beginning of the Qing dynasty. Bilingual Chinese-Manchu inscriptions appeared on many things. Huang Taiji had Chinese books translated into Manchu. Han Chinese and Manchus helped Jesuits write and translate books into Manchu and Chinese. Bannermen wrote fiction in Chinese language. Beijing dialect replaced Manchu. The Qianlong Emperor commissioned projects such as new Manchu dictionaries, both monolingual and multilingual like the Pentaglot. Among his directives were to eliminate directly borrowed loanwords from Chinese and replace them with calque translations which were put into new Manchu dictionaries. This showed in the titles of Manchu translations of Chinese works during his reign which were direct translations contrasted with Manchu books translated during the Kangxi Emperor's reign which were Manchu transliterations of the Chinese characters. The Pentaglot was based on the Yuzhi Siti Qing Wenjian 御製四體清文鑑 ("Imperially-Published Four-Script Textual Mirror of Qing"), with Uyghur added as fifth language. The four language version of the dictionary with Tibetan was in turn based on an earlier three language version with Manchu, Mongolian, and Chinese called the 御製滿珠蒙古漢字三合切音清文鑑 ("Imperially-Published Manchu Mongol Chinese Three pronunciation explanation mirror of Qing"), which was in turn based on the 御製增訂清文鑑 ("Imperially-Published Revised and Enlarged mirror of Qing") in Manchu and Chinese, which used both Manchu script to transcribe Chinese words and Chinese characters to transcribe Manchu words with fanqie. By the final years of the Qing, most Manchus could not speak their language. Chinese fiction books were translated into Manchu. Beijing was where Manchu books were published. A number of European scholars in the 18th century, frustrated by the difficulties in reading Chinese, with its complicated writing system and the classical writing style, considered Manchu translations, or parallel Manchu versions, of many Chinese documents and literary works as a great help to understanding them. Among them was de Moyriac de Mailla (1669–1748), who benefited from the existence of the parallel Manchu text when translating the historical compendium Tongjian Gangmu (Tung-chien Kang-mu; 《通鑒綱目》); Amiot (1718–1793) consulted Manchu translations of Chinese works as well, and wrote that the Manchu language "would open an easy entrance to penetrate … into the labyrinth of Chinese literature of all ages." Study of the Manchu language by Russian sinologists started in the early 18th century, soon after founding of the Russian Orthodox Mission in Beijing, to which most of early Russian sinologists were connected. Illarion Kalinovich Rossokhin (Razsokhin) (died 1761) translated a number of Manchu works, such as The history of Kangxi's conquest of the Khalkha and Oirat nomads of the Great Tartary, in five parts (История о завоевании китайским ханом Канхием калкаского и элетского народа, кочующего в Великой Татарии, состоящая в пяти частях), as well as some legal treatises and a Manchu–Chinese dictionary. In the late 1830s, Georgy M. Rozov translated from the Manchu the History of the Jin (Jurchen) Dynasty. A school to train Manchu language translators was started in Irkutsk in the 18th century, and existed for a fairly long period. A European author remarked in 1844 that the transcription of Chinese words in Manchu alphabet, available in the contemporary Chinese–Manchu dictionaries, was more useful for learning the pronunciation of Chinese words than the inconsistent romanizations used at the time by the writers transcribing Chinese words in English or French books. In 1930, the German sinologist Eric Hauer argued forcibly that knowing Manchu allows the scholar to render Manchu personal and place names that have been "horribly mutilated" by their Chinese transliterations and to know the meanings of the names. He goes on that the Manchu translations of Chinese classics and fiction were done by experts familiar with their original meaning and with how best to express it in Manchu, such as in the Manchu translation of the Peiwen yunfu. Because Manchu is not difficult to learn, it "enables the student of Sinology to use the Manchu versions of the classics […] in order to verify the meaning of the Chinese text". ᠪᠣᡠ᠋; Möllendorff: ilan boo; Abkai: ilan bou), in Fuyu County, in Qiqihar, Heilongjiang Province. A few speakers also remain in Dawujia village in Aihui District of Heihe Prefecture. The Xibe (or Sibe) are often considered to be the modern custodians of the written Manchu language. The Xibe live in Qapqal Xibe Autonomous County near the Ili valley in Xinjiang, having been moved there by the Qianlong Emperor in 1764. Modern written Xibe is very close to Manchu, although there are slight differences in the writing system which reflect distinctive Xibe pronunciation. More significant differences exist in morphological and syntactic structure of the spoken Xibe language. For one example among many, there is a "converb" ending, -mak, that is very common in modern spoken Xibe but unknown in Manchu. Recently, there have been increased efforts to revive the Manchu language. Revival movements are linked to the reconstruction of ethnic Manchu identity in the Han-dominated country. The Manchus mainly lead the revival efforts, with support from the state, NGOs and international efforts. Revivalism began in the post-Mao era when non-Han ethnic expression was allowed. By the 1980s, Manchus had become the second largest minority group in China. People began to reveal their ethnic identities that had been hidden due to 20th century unrests and the fall of the Qing Empire. Language revival was one method the growing numbers of Manchus used in order to reconstruct their lost ethnic identity. Language represented them and set them apart from other minority groups in the "plurality of ethnic cultures within one united culture". Another reason for revivalism lay in the archives of the Qing Empire – a way to translate and resolve historical conflicts between the Manchus and the state. Lastly, the people wanted to regain their language for the rituals and communication to their ancestors – many shamans performing do not understand the words they use. The Manchus conducted most revival efforts. Manchu associations can be found across the country, as well as in Taiwan and Hong Kong. Consisting of mostly Manchus and Mongols, they act as the link between the people, their ethnic leaders and the state. Non-governmental organizations (NGOs) provide large support through "Manchu classes". Manchu is now taught in certain primary schools as well as in universities. It was reported that Heilongjiang University Manchu language research center in no.74, Xuefu Road, Harbin, listed Manchu as an academic major. It is taught there as a tool for reading Qing-dynasty archival documents. The Wall Street Journal reported in 2009 that the language is offered (as elective) in one university, one public middle school, and a few private schools. There are also other Manchu volunteers in many places of China who freely teach Manchu in the desire to rescue the language. Thousands of non-Manchu speakers have learned the language through these measures. Despite the efforts of NGOs, they tend to lack support from high-level government and politics. The state also runs programs to revive minority cultures and languages – Deng Xiaoping promoted bilingual education. However, many programs are not suited to the ethnic culture or to passing knowledge to the younger generations. The locals often look at programs run by the government with distrust. Other support can be found internationally and through the use of the Internet. Post-Cultural Revolution reform allowed for international studies to be done in China. The dying language and ethnic culture of Manchus gained attention, providing local support for reviving the Manchu language. Websites facilitate communication of language classes or articles. Younger generations also take to the Internet to spread and promote their unique identity through popular media. Despite the increased efforts to revive the Manchu language, there are many obstacles standing in the way. Even with increased awareness of ethnic identities, many Manchus choose to give up their language – some opting to learn Mongol instead. Manchu language is still thought of as a foreign language in a Han- dominated Chinese speaking country. Obstacles are also found when gaining recognition from the State. 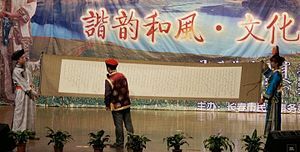 Resistance through censorship prevented the performing of Baijin festivals, a festival in recognition of a new reconstructed Manchu identity, in Beijing. Currently, several thousand people can speak Manchu as a second language through primary education or free classes for adults. Dialects of Manchu include a variety of its historical and remaining spoken forms throughout Manchuria, and the city of Peking (the capital of the former Qing dynasty, when Manchu was referred to as the "national language"). Notable historical Manchu dialects include Peking, Ningguta, Alcuka and Mukden dialects. This section is about the dialect of Manchu spoken in Peking (now known as "Beijing"). For the Northern Mandarin dialect spoken in Beijing, see Beijing dialect. Many of the Manchu words are now pronounced with some Chinese peculiarities of pronunciation, so k before i and e=ch', g before i and e=ch, h and s before i=hs, etc. H before a, o, u, ū, is the guttural Scotch or German ch. A Manchu Grammar: With Analysed Texts, Paul Georg von Möllendorff, p. 1. 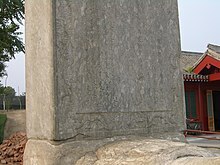 The Manchus of Peking (Beijing) were influenced by the Chinese dialect spoken in the area to the point where pronouncing Manchu sounds was hard for them, and they pronounced Manchu according to Chinese phonetics, whereas the Manchus of Aigun (in Heilongjiang) could both pronounce Manchu sounds properly and mimic the sinicized pronunciation of Manchus in Peking (Beijing), because they learned the Pekinese (Beijing) pronunciation from either studying in Peking or from officials sent to Aigun from Beijing, and they could tell them apart, using the Chinese influenced Pekinese pronunciation when demonstrating that they were better educated or their superior stature in society. Phonetically, there are some characteristics that differentiate the Peking accent from the standard spelling form of Manchu. There are some occasional vowel changes in a word. For example ᠴᡳᠮᠠᡵᡳ (cimari /t͡ʃʰimari/) is pronounced /t͡ʃʰumari/, ᠣᠵᠣᡵᠠᡴᡡ (ojorakū /ot͡ʃoraqʰʊ/) is pronounced /ot͡ɕiraqʰʊ/, and ᡤᡳᠰᡠᠨ (gisun /kisun/) is pronounced /kysun/. In particular, when the vowel /o/ or diphthong /oi/ appears at the beginning of a word, it is frequently pronounce /ə/ and /əi/ respectively in Peking accent. For example, ᠣᠩᡤᠣᠯᠣ (onggolo /oŋŋolo/) is pronounced /əŋŋolo/, ᠣᡳᠯᠣ (oilo /oilo/) is pronounced /əilo/. Diphthongization of vowels. /ə/ becomes /əi/ (such as ᡩᡝᡥᡳ dehi /təxi/ pronounced /təixi/), /a/ becomes /ai/ (such as ᡩᠠᡤᡳᠯᠠᠮᠪᡳ dagilambi /takilampi/ pronounced /taikilami/), and /i/ becomes /iu/ (such as ᠨᡳᡵᡠ niru /niru/ pronounced /niuru/, and ᠨᡳᠴᡠᡥᡝ nicuhe /nit͡ʃʰuxə/ pronounced /niut͡ʃʰuxə/). /oi/ becomes /uai/, especially after /q/ (g). For example, ᡤᠣᡳ᠌ᠮᠪᡳ goimbi /koimpi/ becomes /kuaimi/. Disappearance of vowels under certain conditions. The vowel /i/ following consonant /t͡ʃʰ/ (c) or /t͡ʃ/ (j) usually disappears. For example, ᡝᠴᡳᡴᡝ ecike /ət͡ʃʰikʰə/ is pronounced /ət͡ʃʰkʰə/, and ᡥᠣᠵᡳᡥᠣᠨ hojihon /χot͡ʃiχon/ is pronounced /χot͡ʃχon/. There are also other cases where a vowel disappears in Peking accent. For example, ᡝᡴᡧᡝᠮᠪᡳ ekšembi /əkʰʃəmpi/ is pronounced /əkʰʃmi/, and ᠪᡠᡵᡠᠯᠠᠮᠪᡳ burulambi /purulampi/ is pronounced /purlami/. Manchu phrases are all head-final. This means that the head-word of a phrase (e.g. the noun of a noun phrase, or the verb of a verb phrase) always falls at the end of the phrase. Thus, adjectives and adjectival phrases always precede the noun they modify, and the arguments to the verb always precede the verb. As a result, Manchu sentence structure is subject–object–verb (SOV). In this example, the postposition emgi, "with", requires its nominal argument to have the genitive case, and so we have the genitive case-marker i between the noun niyalma and the postposition. That woman came out of the house. That woman went to town. That woman, having come out of the house, went to town. That woman, coming out of the house, went to town. That woman, though she came out of the house, went to town. Manchu has five cases. The cases are marked by particles that can be written either with the noun to which they apply or separately. The particles do not obey the rule of vowel harmony, yet they are also not truly postpositions. genitive (i or ni) – one of the principal syntactic cases; used to indicate possession or means by which something is accomplished. Its primary function is to indicate the possessive one. dative-locative (de) – used to indicate location, time, place, or indirect object. ablative (ci) – used to indicate the origin of an action or the basis for a comparison. In addition, there were some suffixes, such as the primarily adjective-forming suffix -ngga/-ngge/-nggo, that appear to have originally been case markers (in the case of -ngga, a genitive case marker), but which had already lost their productivity and become fossilized in certain lexemes by the time of the earliest written records of the Manchu language: e.g. agangga "pertaining to rain" as in agangga sara (an umbrella), derived from Manchu aga (rain). Written Manchu was close to being called an "open syllable" language because the only consonant that came regularly at the end of native words was /n/, similar to the situation in Beijing Mandarin, Northeastern Mandarin, Jilu Mandarin and Japanese. This resulted in almost all native words ending in a vowel. In some words, there were vowels that were separated by consonant clusters, as in the words ilha ('flower') and abka ('heaven'); however, in most words, the vowels were separated from one another by only single consonants. This open syllable structure might not have been found in all varieties of spoken Manchu, but it was certainly found in the southern dialect that became the basis for the written language. It is also apparent that the open-syllable tendency of the Manchu language had been growing ever stronger for the several hundred years since written records of Manchu were first produced: consonant clusters that had appeared in older forms, such as abka and abtara-mbi ('to yell'), were gradually simplified, and the words began to be written as aga or aha (in this form meaning 'rain')[dubious – discuss] and atara-mbi ('to cause a commotion'). Manchu has twenty consonants, shown in the table using each phoneme's representation in the IPA, followed by its romanization in italics. /p/ was rare and found mostly in loanwords and onomatopoeiae, such as pak pik ('pow pow'). Historically, /p/ appears to have been common, but changed over time to /f/. /ŋ/ was also found mostly in loanwords and onomatopoeiae and there was no single letter in the Manchu alphabet to represent it, but rather a digraph of the letters for /n/ and /k/. [ɲ] is usually transcribed with a digraph ni, and has thus often been considered a sequence of phonemes /nj/ rather than a phoneme of its own, though work in Tungusic historical linguistics suggests that the Manchu palatal nasal has a very long history as a single segment, and so it is shown here as phonemic. Early Western descriptions of Manchu phonology labeled Manchu b as "soft p", Manchu d as "soft t", and Manchu g as "soft k", whereas Manchu p was "hard p", t was "hard t", and k was "hard k". This suggests that the phonological contrast between the so-called voiced series (b, d, j, g) and the voiceless series (p, t, c, k) in Manchu as it was spoken during the early modern era was actually one of aspiration (as shown here) or tenseness, as in Mandarin. Unusually, /s/ was affricated to [ts] in some or all contexts. /tʃʰ/, /tʃ/, and /ʃ/ were palatalized before /i/ or /y/ to [tɕʰ], [tɕ], and [ɕ], respectively. /kʰ/ and /k/ were backed before /a/, /ɔ/, or /ʊ/ to [qʰ] and [q], respectively. Some scholars analyse these uvular realizations as belonging to phonemes separate from /kʰ/ and /k/, and they were distinguished in the Manchu alphabet, but are not distinguished in the romanization. In this vowel system, the "neutral" vowels (i and u) were free to occur in a word with any other vowel or vowels. The lone front vowel (e, but generally pronounced like Mandarin [ɤ] ) never occurred in a word with either of the regular back vowels (o and a), but because the rules of vowel harmony are not perceptible with diphthongs, the diphthong eo occurs in some words, i.e. deo, "younger brother", geo, "a mare", jeo, "department", leole, "to discuss", leose, "building", and šeole, "to embroider", "to collect". The relatively rare vowel transcribed ū (pronounced [y] according to Paul Georg von Möllendorff ) was usually found as a back vowel; however, in some cases, it was found occurring along with the front vowel e. Much disputation exists over the exact pronunciation of ū. Erich Hauer, a German sinologist and Manchurist, proposes that it was pronounced as a front rounded vowel initially, but a back unrounded vowel medially. William Austin suggests that it was a mid-central rounded vowel. The modern Shibe (Xibe) pronounce it identically to u. Remarkably Manchu was able to absorb a large number of nonnative sounds into the language from Chinese. There were special symbols used to represent the vowels of Chinese loanwords. These sounds are believed to have been pronounced as such, as they never occurred in native words. Among these, was the symbol for the high unrounded vowel (customarily romanized with a y) found in words such as sy (Buddhist temple) and Sycuwan (Sichuan). Chinese affricates were also represented with consonant symbols that were only used with loanwords such as in the case of dzengse (orange) (Chinese: chéngzi) and tsun (inch) (Chinese: cùn). In addition to the vocabulary that was borrowed from Chinese, the Manchu language also had a large amount of loanwords from other languages such as Mongolian, for example the words morin (horse) and temen (camel). The vowel harmony found in the Manchu language was traditionally described in terms of the philosophy of the I Ching. Syllables with front vowels were described as being as "yin" syllables whereas syllables with back vowels were called "yang" syllables. The reasoning behind this was that the language had a kind of sound symbolism where front vowels represented feminine objects or ideas and the back vowels represented masculine objects or ideas. As a result, there were a number of word pairs in the language in which changing the vowels also changed the gender of the word. For example, the difference between the words hehe (woman) and haha (man) or eme (mother) and ama (father) was essentially a contrast between the front vowel, [e], of the feminine and the back vowel, [a], of the masculine counterpart. The Manchu language was spoken in the Korean film War of the Arrows. Ryu Seung-ryong, cast in the role of Jyushinta, and Moon Chae-won, who played Choi Ja-in, speak Manchu often in the film. It was also spoken in the film Flying Swords of Dragon Gate, in which it was called Tartar. Paul Georg von Möllendorff (1892). A Manchu grammar: with analysed texts. Printed at the American Presbyterian mission press. p. 52. Retrieved 1 March 2012. A. Wylie (1855). Translation of the Ts'ing wan k'e mung, a Chinese Grammar of the Manchu Tartar Language; with introductory notes on Manchu Literature: (translated by A. Wylie.). Mission Press. Retrieved 1 March 2012. Thomas Taylor Meadows (1849). Translations from the Manchu: with the original texts, prefaced by an essay on the language. Canton: Press of S.W. Williams. pp. 54http://www.endangeredlanguages.com/lang/1205/guide/6302. Retrieved 10 February 2012. Liu, Jingxian; Zhao, Aping; Zhao, Jinchun (1997). 满语研究通论 (General Theory of Manchu Language Research). Heilongjiang Korean Nationality Publishing House. ISBN 9787538907650. Ji, Yonghai (2011). 满语语法 (Manchu Grammar). Minzu University of China Press. ISBN 9787811089677. Aisin Gioro, Yingsheng (2004). 满语杂识 (Divers Knowledges of Manchu language). Wenyuan Publishing House. ISBN 7-80060-008-4.
von Möllendorff, P. G. (1890). "Essay on Manchu Literature". Journal of the China Branch of the Royal Asiatic Society for the Year ..., Volumes 24-25. The Branch: 1–45. Wade, Thomas Francis (1898). Herbert Allen Giles, ed. A catalog of the Wade collection of Chinese and Manchu books in the library of the University of Cambridge. University Press. Cambridge University Library (1898). A Catalogue of the Collection of Chinese and Manchu Books Given to the University of Cambridge. The University Press. James Summers, ed. (1872). Descriptive catalogue of the Chinese, Japanese, and Manchu books. Klaproth, Heinrich Julius (1822). Verzeichniss der chinesischen und mandshuischen Bücher und Handschriften der K. Bibliothek zu Berlin (in German). Paris: In der Königlichen Drunerel. ^ a b "Ta Kung Pao: Saving Manchu Language and Reviving Manchu Culture" (in Chinese). 26 April 2015. Archived from the original on 2017-11-08. ^ Hammarström, Harald; Forkel, Robert; Haspelmath, Martin, eds. (2017). "Manchu". Glottolog 3.0. Jena, Germany: Max Planck Institute for the Science of Human History. ^ Fletcher (1973), p. 141. ^ Asiatic journal and monthly miscellany. London: Wm. H. Allen & Co. May–August 1837. p. 197. ^ Asiatic journal and monthly miscellany. London: Wm. H. Allen & Co. May–August 1837. p. 198. ^ Translation of the Ts'ing wan k'e mung, a Chinese Grammar of the Manchu Tartar Language; with introductory notes on Manchu Literature: (translated by A. Wylie.). Mission Press. 1855. pp. xxvii–. ^ Shou-p'ing Wu Ko (1855). Translation (by A. Wylie) of the Ts'ing wan k'e mung, a Chinese grammar of the Manchu Tartar language (by Woo Kĭh Show-ping, revised and ed. by Ching Ming-yuen Pei-ho) with intr. notes on Manchu literature. pp. xxvii–. ^ Gertraude Roth Li (2000). Manchu: a textbook for reading documents. University of Hawaii Press. p. 16. ISBN 0824822064. Retrieved 25 March 2012. Alphabet: Some scholars consider the Manchu script to be a syllabic one. ^ Meadows 1849, p. 3. ^ Saarela 2014, p. 169. ^ Rhoads 2000, p. 109. ^ Zhao, Gang (January 2006). "Reinventing China: Imperial Qing Ideology and the Rise of Modern Chinese National Identity in the Early Twentieth Century" (PDF). 32 (Number 1). Sage Publications: 12. doi:10.1177/0097700405282349. JSTOR 20062627. Archived from the original on 25 March 2014. Retrieved 23 May 2014. ^ S. Robert Ramsey (1987). The Languages of China. Princeton University Press. pp. 213–. ISBN 0-691-01468-X. ^ Rhoads (2000), p. 95. ^ Adolphson, Mikael S. (2003). Hanan, Patrick, ed. Treasures of the Yenching: Seventy-fifth Anniversity of the Harvard-Yenching Library : Exhibition Catalogue. Volume 1 of Harvard-Yenching Library studies: Harvard Yenching Library. Chinese University Press. p. 84. ISBN 9629961024. ^ Adolphson, Mikael S. (2003). Hanan, Patrick, ed. Treasures of the Yenching: Seventy-fifth Anniversity of the Harvard-Yenching Library : Exhibition Catalogue. Volume 1 of Harvard-Yenching Library studies: Harvard Yenching Library. Chinese University Press. p. 85. ISBN 9629961024. ^ Mosca, Mathew W. (December 2011). "The Literati rewriting of China in The QianLong-Jiaqing Transition". Late Imperial China. the Society for Qing Studies and The Johns Hopkins University Press. 32 (2): 106–107. ^ Mosca, Mathew W. (2010). Empire and the Circulation of Frontier Intelligence Qing Conceptions of the Otomans. Harvard Journal of Asiatic Studies. 70. The Harvard-Yenching Institute. p. 181. ^ Mosca, Mathew W. (2010). Empire and the Circulation of Frontier Intelligence Qing Conceptions of the Otomans. Harvard Journal of Asiatic Studies. 70. The Harvard-Yenching Institute. p. 182. ^ Mosca, Mathew W. (2010). Empire and the Circulation of Frontier Intelligence Qing Conceptions of the Otomans. Harvard Journal of Asiatic Studies. 70. The Harvard-Yenching Institute. p. 176. ^ Rhoads, Edward J. M. (2017). Manchus and Han: Ethnic Relations and Political Power in Late Qing and Early Republican China, 1861-1928. University of Washington Press. p. 62. ISBN 0295997486. ^ Rhoads, Edward J. M. (2017). Manchus and Han: Ethnic Relations and Political Power in Late Qing and Early Republican China, 1861-1928. University of Washington Press. p. 109. ISBN 0295997486. ^ Naquin, Susan (2000). Peking: Temples and City Life, 1400-1900. University of California Press. p. 382. ISBN 0520923456. ^ Rhoads, Edward J. M. (2017). Manchus and Han: Ethnic Relations and Political Power in Late Qing and Early Republican China, 1861-1928. University of Washington Press. p. 61. ISBN 0295997486. ^ Kuo, Ping Wen (1915). The Chinese System of Public Education, Issue 64. Volume 64 of Teachers College New York, NY: Contrib. to education (2 ed.). Teachers College, Columbia University. p. 58. ^ Contributions to Education, Issue 64. Bureau of Education, Teachers College, Columbia University. 1915. p. 58. ^ Jami, Catherine (2012). The Emperor's New Mathematics: Western Learning and Imperial Authority During the Kangxi Reign (1662-1722) (illustrated ed.). Oxford University Press. p. 167. ISBN 0199601402. ^ Idema, Wilt L., ed. (2007). Books in Numbers: Seventy-fifth Anniversary of the Harvard-Yenching Library : Conference Papers. Volume 8 of Harvard-Yenching Institute studies. Chinese University Press. p. 215. ISBN 9629963310. ^ Idema, Wilt L., ed. (2007). Books in Numbers: Seventy-fifth Anniversary of the Harvard-Yenching Library : Conference Papers. Volume 8 of Harvard-Yenching Institute studies. Chinese University Press. p. 209. ISBN 9629963310. ^ Yong, Heming; Peng, Jing (2008). Chinese Lexicography : A History from 1046 BC to AD 1911: A History from 1046 BC to AD 1911. Oxford University Press. p. 398. ISBN 0191561673. Retrieved 24 April 2014. ^ Yong, Heming; Peng, Jing (2008). Chinese Lexicography : A History from 1046 BC to AD 1911: A History from 1046 BC to AD 1911. Oxford University Press. p. 397. ISBN 0191561673. Retrieved 24 April 2014. ^ Printing and Book Culture in Late Imperial China. Volume 27 of Studies on China. University of California Press. 2005. p. 321. ISBN 0520927796. ^ Printing and Book Culture in Late Imperial China. Volume 27 of Studies on China. University of California Press. 2005. p. 323. ISBN 0520927796. ^ Hauer (1930), p. 162-163. ^ a b c d e f g "Identity reproducers beyond the grassroots: The middle class in the Manchu revival since 1980s". Asian Ethnicity. 6. ^ a b c d e f g h "Facing the Decline of Minority Languages: The New Patterns of Education of Mongols and Manchus". The Central European Journal of Social Sciences and Humanities. ^ Gorelova, Liliya M., ed. (2002). Manchu Grammar, Part 8. 7. Brill. p. 77. ISBN 9004123075. ^ Cahiers de linguistique: Asie orientale, Volumes 31-32. Ecole des hautes études en sciences sociales, Centre de recherches linguistiques sur l'Asie orientale. 2002. p. 208. ^ Shirokogoroff, S. M. (1934). "Reading and Transliteration of Manchu Lit.". Archives polonaises d'etudes orientales, Volumes 8-10. Państwowe Wydawn. Naukowe. p. 122. ^ Shirokogoroff, S. M. (1934). "Reading and Transliteration of Manchu Lit.". Rocznik orientalistyczny, Volumes 9-10. p. 122. ^ a b c d e f g h i j Goreleva, Liliya (2002). Manchu grammar. Leiden: Brill. pp. 163–193. ^ Tawney, Brian. "Reading Jakdan's Poetry: An Exploration of Literary Manchu Phonology". MA Thesis (Harvard, RSEA). ^ Li (2000), p. 17. Elliott, Mark (2013). "Why Study Manchu?". Manchu Studies Group. Hauer, Erich (1930). "Why the Sinologue Should Study Manchu" (PDF). Journal of the North China Branch of the Royal Asiatic Society. 61: 156–164. Li, Gertraude Roth (2000). Manchu: A Textbook for Reading Documents. Honolulu, Hawaii: University of Hawai`i Press. ISBN 0824822064. Erling von Mende. 2015. “In Defence of Nian Gengyao, Or: What to Do About Sources on Manchu Language Incompetence?”. Central Asiatic Journal 58 (1-2). Harrassowitz Verlag: 59–87. https://www.jstor.org/stable/10.13173/centasiaj.58.1-2.0059. Norman, Jerry. 1974. "Structure of Sibe Morphology", Central Asian Journal. Norman, Jerry. 1978. A Concise Manchu–English Lexicon, University of Washington Press, Seattle. Norman, Jerry. 2013. A Comprehensive Manchu–English Dictionary, Harvard University Press (Asia Center), Cambridge ISBN 9780674072138. Kane, Daniel. 1997. “Language Death and Language Revivalism the Case of Manchu”. Central Asiatic Journal 41 (2). Harrassowitz Verlag: 231–49. https://www.jstor.org/stable/41928113. Look up Manchu Swadesh vocabulary list in Wiktionary, the free dictionary. "A Manchu Grammar with Analysed Texts"
Wikivoyage has a travel guide for Manchu phrasebook. Tawney, Brian. "Reading Jakdan's Poetry: An Exploration of Literary Manchu Phonology". AM Thesis (Harvard, RSEA).